It’s a good time to be working on 40k. The new 8th edition books are being released and new kits seem to come out weekly. 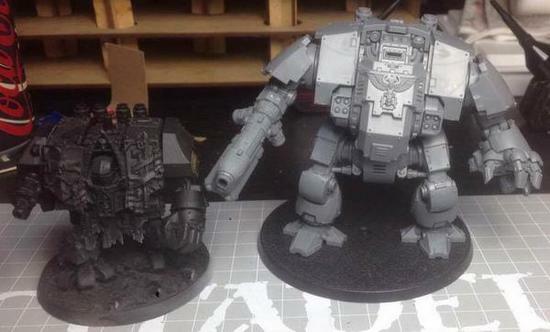 I’ve primarily focused on my Black Templars, but I can’t resist a new toy, so over the weekend I grabbed a Primaris Redemptor Dreadnought along with a Space Marine codex. The kit itself is great. As everyone has probably seen in the previews, the armor plating covering the sarcophagus can swing open in order to show the details beneath. From a gameplay perspective it has no purpose, but it is a cool feature nonetheless. 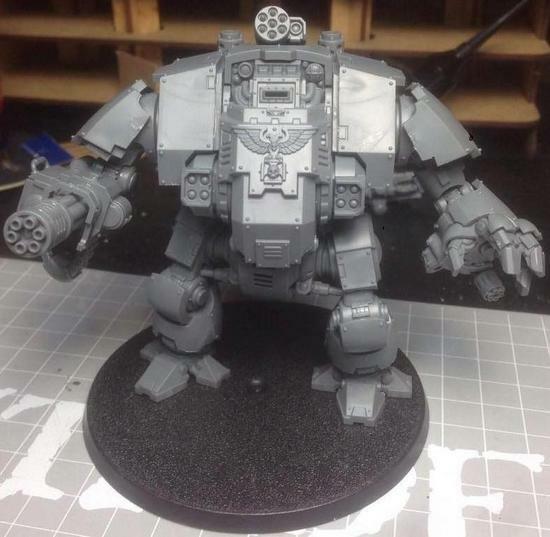 And, finally, a dreadnought that can be posed! The arms and legs can both be moved around a little bit in order to change up the stance slightly, adding a bit of uniqueness if you have multiple Redemptors on field. Games Workshop also included two different armor plates for over the sarcophagus, with different details sculpted on, allowing you to differentiate a bit more. The arms have a decent range of motion for posing. The primary weapon can be either a Heavy Onslaught Gatling Cannon or a Macro Plasma Incinerator. The Gatling cannon provides a large amount of anti-infantry firepower, while the Incinerator gives you good anti-armor capability. Fortunately, these two weapons are completely independent in terms of parts required, so you can build both and freely swap the weapon out if you want to change things up. With just the plain grey plastic, the weapon fits snugly into the socket on the shoulder without gluing, and doesn’t seem like it would drop out during gaming. Magnetizing would ensure this, but it doesn’t seem necessary. The secondary weapon attaches to the Redemptor fist on the other arm, but wouldn’t be easy to magnetize/swap out due to the additional connection points between the weapon and the arm. 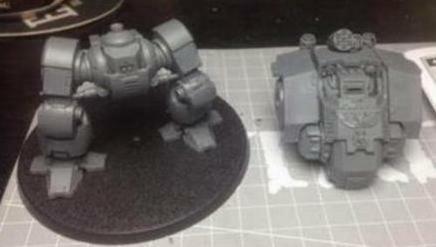 You have a choice between another (smaller) variant of the Onslaught Gatling Cannon or a Heavy Flamer, both of which are solid choices depending on what role you want your Redemptor to fill. The final weapon choices are the hull mounted storm bolters or fragstorm launchers, which are easy little one-part weapons on the lower torso. Sadly the decal sheet is limited in terms of chapter markings, which seems to be a common theme of the new kits. Hopefully GW plans on making up for this by releasing transfer sheets similar to what Forge World puts out for the 30k Legions. Those sheets are wonderful; I have a copy of the Imperial Fists one already, which is fortunate as that is how I intend to paint up my Primaris forces. This most likely won’t occur until after I’ve finished up a solid 2,000 points of Black Templars as part of our Warlords series, but as soon as I get working on them progress will be posted!